Missing cat – have you seen it? A cat has gone missing from the FARA area. The cat pictured is missing from the top of Montague Road, where it borders Wanstead Flats. 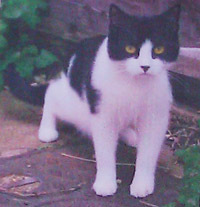 The cat is black and white, and notably has an all-black nose. He answers to the name of Ben. Please check your sheds in case he’s trapped inside! If you find Ben, please call 07765 004602 – even if the worst has happened his owner wants to know. Posted in Miscellaneous. Comments Off on Missing cat – have you seen it? « Lincolns pub to be demolished to make way for flats?